OK, so now on to the wrap up. 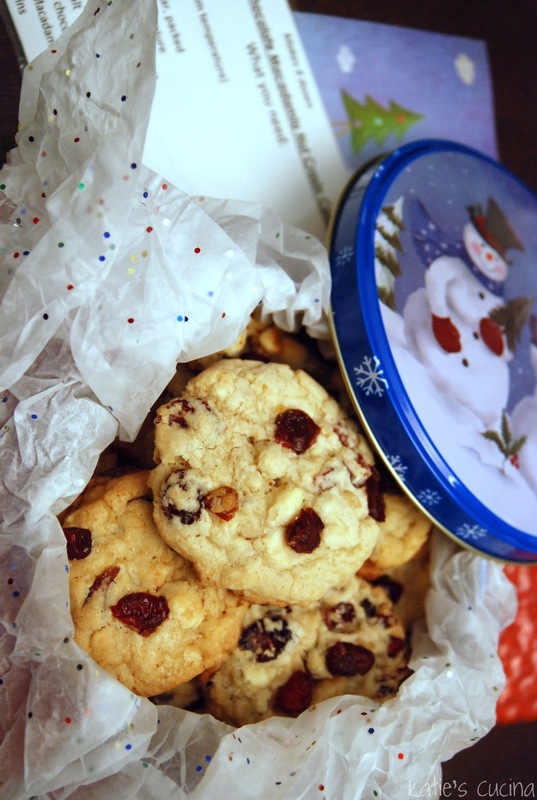 Today, I’m sharing what cookies I received! This was the first batch of cookies I received (a week before my other cookies). This is the best of both worlds. Part brownie part cookie! It gives a nice balance of both milk chocolate and white chocolate. I did have a few casualties from this box (aka cookies that crumbled and didn’t make it in one piece); however, I liked the cookie crumbs just as much as I liked the whole cookie! The next two sets of cookies I received on the same day! I was on sugar overload. OMG–run to Tran’s blog now and get this recipe. These cookies are unbelievably soft and chewy and taste like they came from a bakery! AMAZING. I’m not a big fan of rocky road ice cream but I sure am of the cookie version. Tran also sent two Hot Chocolate on a Stick (with homemade peppermint marshmallows)! I can’t wait to try these little delectable treats! I’ve made these cookies before and they are probably one of my favorite to make. These are also one of my husbands favorite cookies since they contain only white chocolate (he’s not a big chocolate fan). I love everything about these cookies. The craisins, macadamia nuts, and the white chocolate. If you’ve never had one of these cookies or made a batch of these cookies you must go over to Big Bears Wife and give this recipe a whirl! Yes, that’s right. They are already starting to think about next years cookie swap! I got Tuxedo Brownie Hug Cookies and Rocky Road Cookies from them too! They were amazing! I'm so glad you like the cookies I sent! The one piece cookies looks stunning. How I wish I had been able to participate in this year's swap! Next year, I definitely will. Right after our kitchen remodeling nyc is finished.